In much of the world, the Feast of Saint Nicholas is a separate holiday from Christmas. It is celebrated around the 5th of December, and is the major gift-giving holiday. 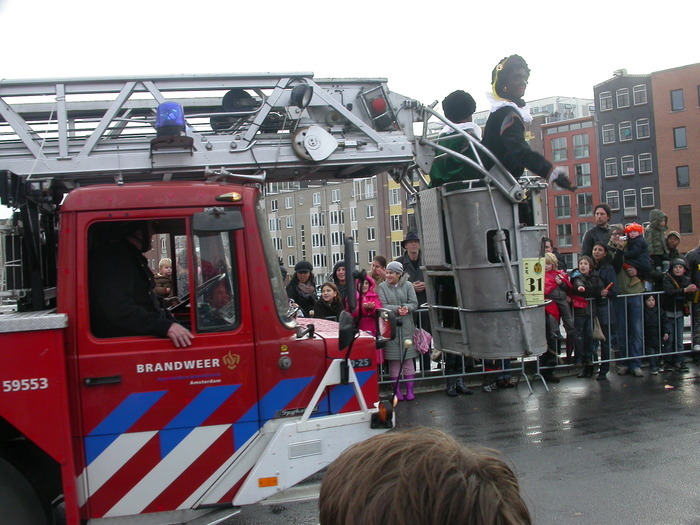 A few weeks earlier, in the Netherlands, Sinterklaas arrives on his steam ship. 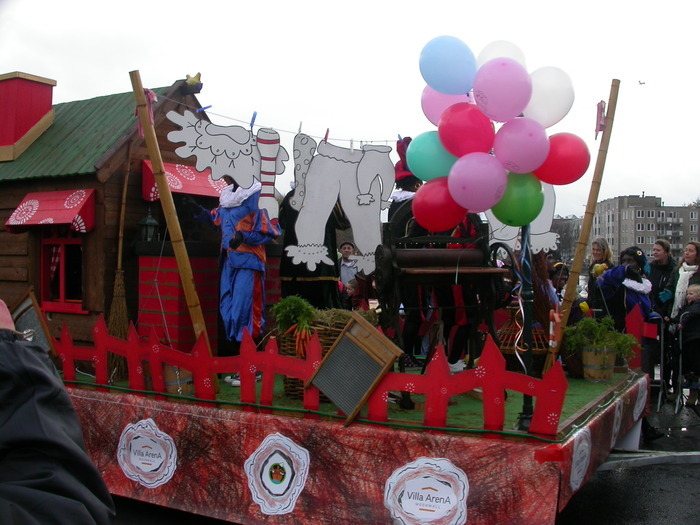 The schip bearing the Sint. 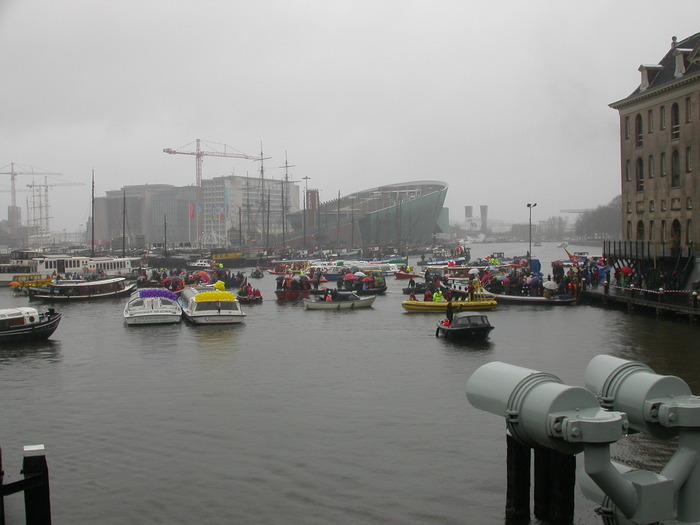 The nautical crowd gathers to watch the Sint depart his ship. The big green boat-looking thing in the background is the Nemo museum. 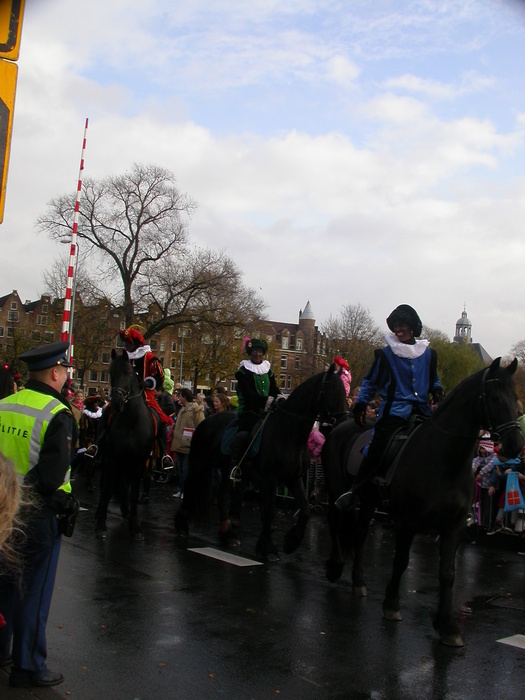 And, of course, the Sint is accompanied by a great mass of Zwarte Pieten. 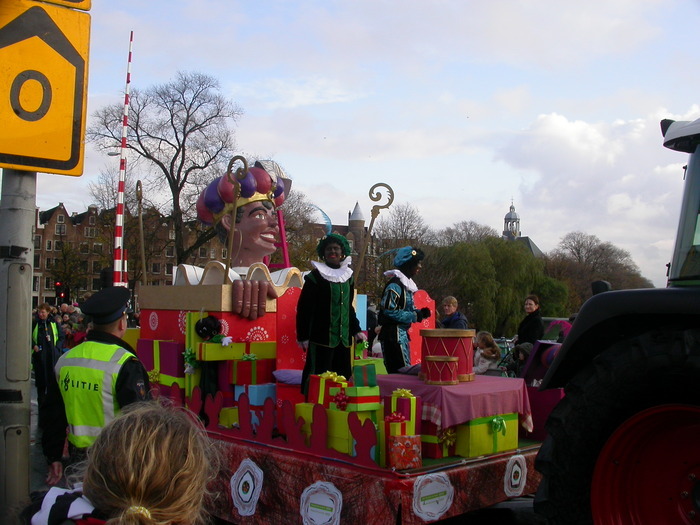 If you didn't know: Zwarte Piet is the predecessor to Santa's elves. 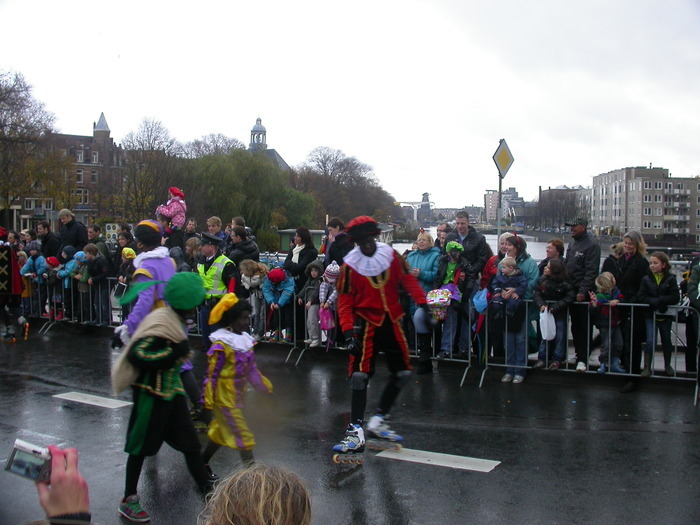 The stories of the origin of Piet vary: in some stories he was a slave who was freed by Saint Nicholas, in some he is a Spanish trader who just happens to be hanging around the Sint, in some he is not Moorish at all but his face is black with soot from the chimney. 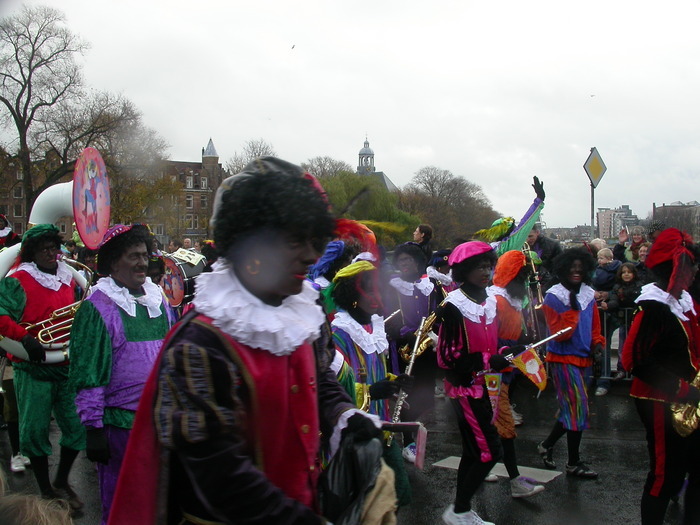 In any case, in the Netherlands, once per year it is perfectly acceptable for the blonde Netherlanders to put on blackface and a curly wig. En masse. 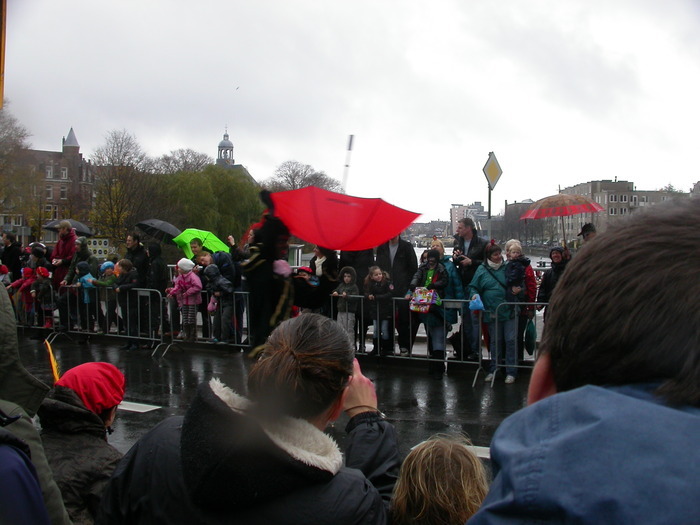 Zwarte Piet often plays the role of the fool as well, and this is pictured doing something silly: in this case carrying his umbrella the wrong way. 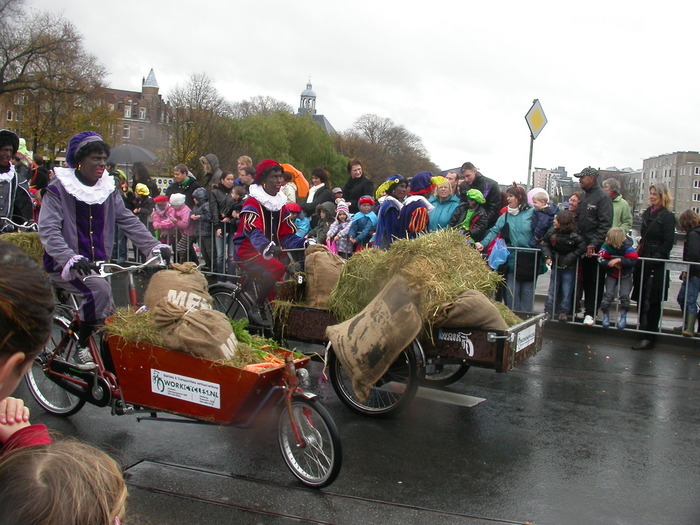 Note the Pieten with bakfietsen full of carrots and hay. 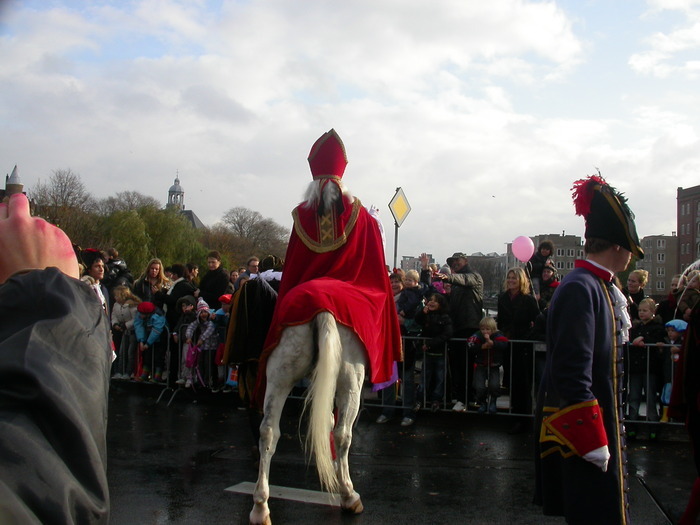 Sinterklaas rides a white horse, and the children leave carrots in their shoes for the horse so that the Sint will come and leave them gifts. 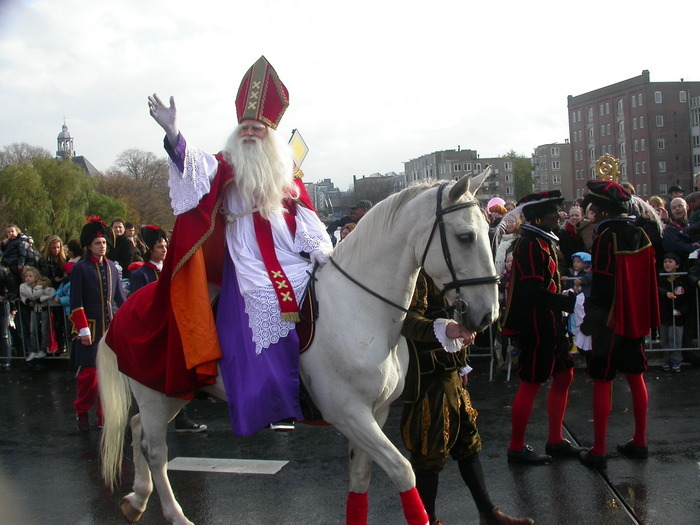 Sinterklaas' white horse probably stems from Norse legends of Odin's white horse Sleipnir. 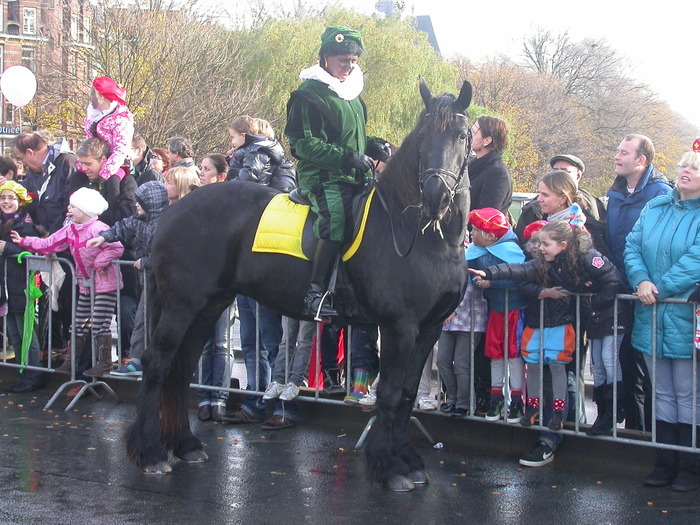 In the Norse tradition, at Yuletide, children would leave carrots or straw in their shoes for Odin's flying horse Sleipnir, and in return Odin would leave them candy and gifts. 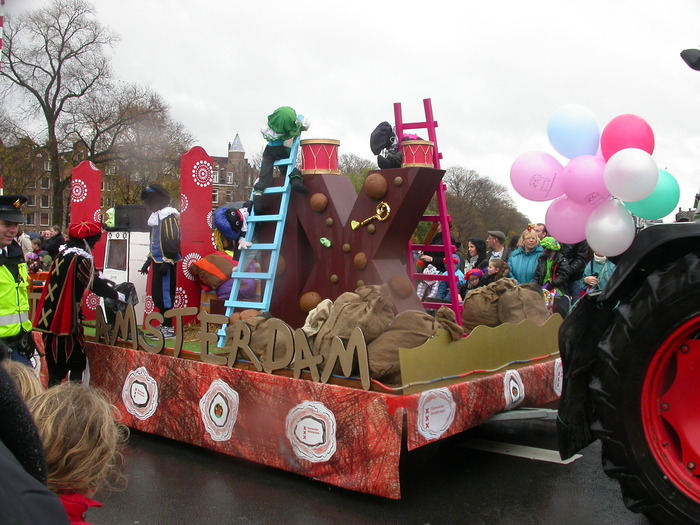 A float full of symbols of the season: chocolate letters (also gifts from Sinterklaas), bags (which Piet carries), and the Pieten. 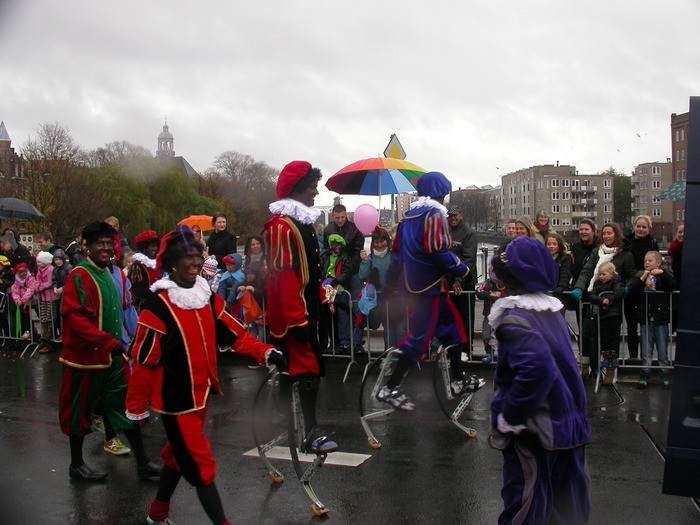 A parade of Pieten in the rain. Some Pieten airing their laundry. The fire department gets in on the parade too. 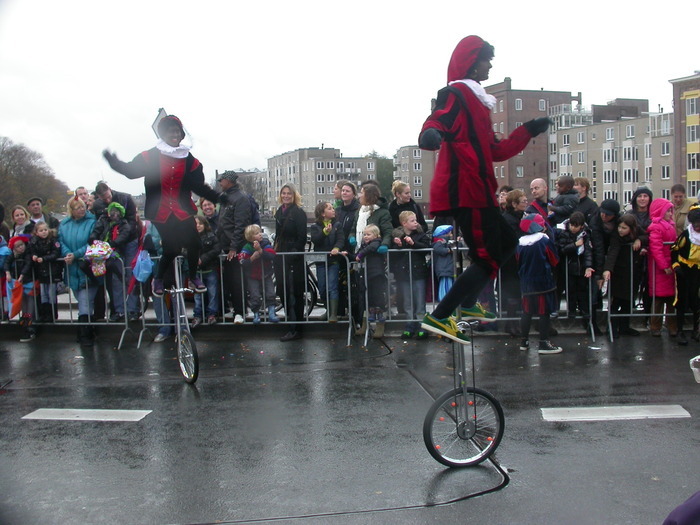 The Pieten are tossing pepernoten out to the crowd. 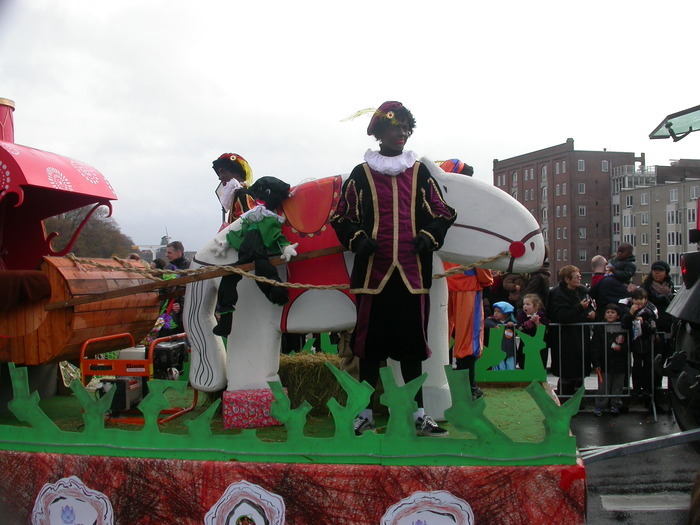 Pieten with a fake Sinterklaas horse. 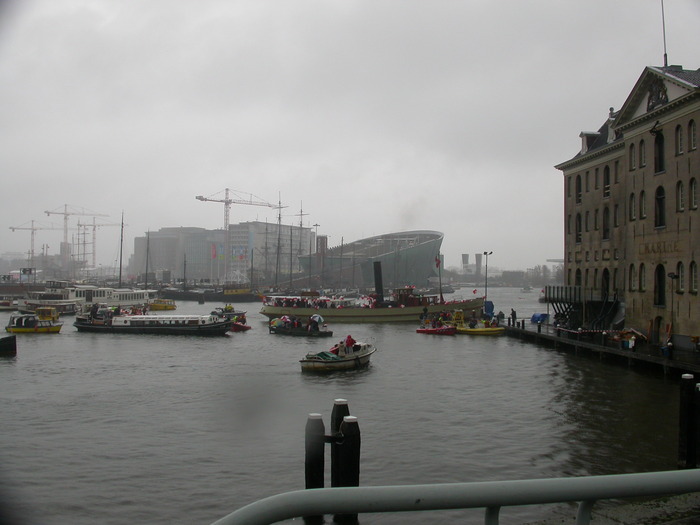 Our first view of the Sint in 2009. Finally a good view of the Goedheiligman. Pieten op paarden. 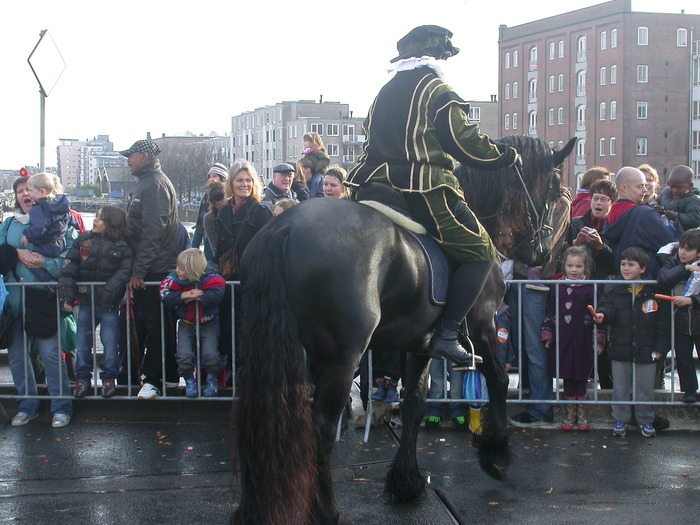 The Peten come on black horses (Frisians, note the big feet and wavy tails). 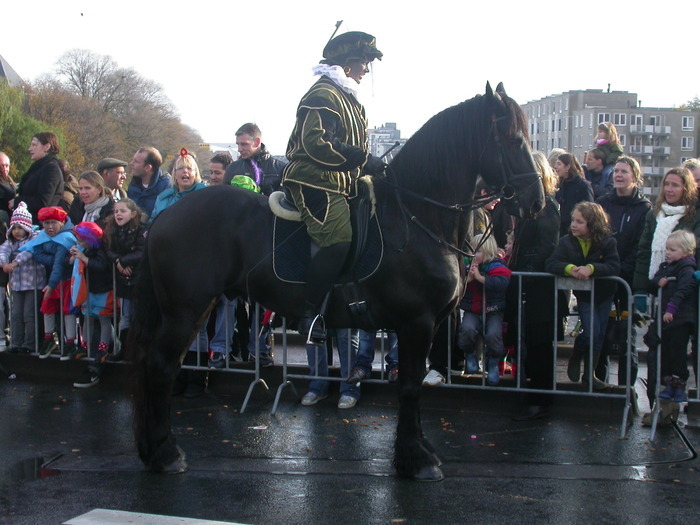 This Frisian has figured out that the Sinterklaas parade is a pretty good deal. The kids have handfuls of carrots and hay for the horses. This one poses for the camera, and contemplates if he can possibly eat another carrot. Well, okay, maybe one more.